The US television market continues to shift toward digital. As traditional pay TV fades in the US, SVOD continues to charge ahead and will eclipse pay TV in 2019. Meanwhile, vMVPD’s stellar growth is slowing, and over-the-air TV continues to make modest gains. 2018 saw the number of homes with a cable, satellite, or telco TV subscription decline 4%, to reach 89.5 million. [i] The penetration of occupied homes fell to 73.1%, a drop of 4.5%. Penetration of occupied homes fell faster than the number of traditional pay TV homes because the number of occupied homes increased by 2.3 million between 2017 and 2018, to reach 122.5 million. With vMVPD prices increasing, the decline in traditional pay TV could slow a little in 2019. However, do not expect it to reverse. vMVPD services can still save consumers, even after some sizable price increases. The number of US homes with at least one SVOD subscription increase 5% between mid-2017 and 2018, to reach 84.5 million. Two-thirds of occupied US homes now subscribe to SVOD services, an increase of 5% over the previous year. Signs are that the SVOD market could see another significant expansion in 2019. Major new services from Disney, WarnerMedia, and NBCU could attract more people currently on the sidelines. As well, Netflix continues to generate high growth in the US, despite crossing the 50% penetration barrier. In 2018, the company grew paid US subscribers 10%, and Q1 2019 saw another 3% increase. DTV Research forecast that the number of North American SVOD subscription will increase by 69% between 2018 and 2024. Even with Netflix forecasting a slowing trend in subscriber acquisition for 2019, it looks like the number of homes with SVOD will exceed the amount with traditional pay TV by the end of the year. Nielsen says 1 5.5 million homes are using an over-the-air (OTA) antenna to watch television in the U.S. The number of households increased 1.6% between mid-2017 and 2018. 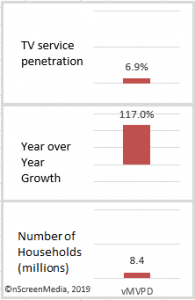 Penetration now stands at 12.7%. Most of the growth in the use of OTA TV come from homes that also have broadband. As SVOD homes decide to cancel traditional pay TV, OTA TV provides a convenient free way to keep up with local sports, news, and events. Watch for a small uptick in growth in 2019. vMVPDs are another way to catch local TV, but increasing prices make free OTA TV that more attractive. It could motivate more people to go to the trouble of putting up an antenna. There are 8.4 million vMVPD subscriptions in the US, with a household penetration of 6.9%. Year-over-year growth was an impressive 117%. However, growth could slow significantly in 2019. YouTube TV just announced an enormous 25% to 43% price increase, to $50 a month. All the other significant vMVPDs have also instituted significant increases over the last six months. Expect the price increases to keep coming. vMVPD services still represent a good value over traditional pay TV. Dish Network’s Sling TV is now the low-price leader with a $25 entry price. DirecTV Now’s entry price is $35, Hulu Live is $45, and YouTube TV $50. This opinion gives you a complete picture of TV services in the US at the end of 2018. It shows the number of households, penetration, and growth for traditional pay TV, SVOD, over-the-air, and vMVPD.